See scan – perfect condition for this fine antique jewelry. This is an extremely rare and important pair of antique 19th century Victorian gold cufflinks with red enamel and gold Venetian winged lions of St. Mark at center all surrounded by exquisite circle frame of natural seed pearls and small ruby gem stones resembling a bead chain. This fantastic Venetian / Venice master jeweler set is crafted in the exceptional manner of the highest grade and quality antique jewelry of that time. Each cuff has a chain attached to a two sided bullet shaped button to attach to the shirt’s sleeve. The cuffs appear to be 14 or higher 18 karat gold and diameter of each cuff is 15mm. The enamel work is completely intact and in perfect shape. Both cuffs weigh approximately 7.5 grams and at each base there is nice open filigree work. The winged lion is a symbol of peace. The lion with an open book is a symbol of peace, while with book closed is a symbol of war. From the common cat (felis catus), the Venetians, their horizons enlarged by their imperial and commercial adventures, turned to the lion (leo leo), and were eventually besotted by him. Leo leo turned their heads! They built him onto their corbels, they slipped him into their allegories, they stuck him on gateposts, they made him the corner-stones of bridges. Citizens kept live lions in their gardens, and for a time a State Lion lived in a golden cage in the Piazza; he died, it is said, because licking the bars gave him gilt poisoning, and thereafter captive lions were forbidden for several centuries. When one turned up, though, at the Venetian Carnival of 1762, Pietro Longhi showed him grandly on display, with a little dog on his back, dancing dogs all around him, a monkey on a beam above, a fiddler fiddling, and the strolling Venetians engrossed as ever by his presence. According to the legend - two or three ambitious Chamber of Commerce types from Venice stole the remains of St. Mark the Apostle from his tomb in Alexandria, Egypt. William Lithgow tells the story in his "Comments on Italy" from The Rare Adventures and Painfull Peregrinations, published in 1614 and quoted in Ian Littlewood's Venice "A Literary Companion" - They placed the corpse in a large basket covered with herbs and swine's flesh which the Musselmans [Muslims] hold in horror, and the bearers were directed to cry Khwazir (pork), to all who should ask questions or approach to search. In this manner they reached the vessel. The body was enveloped in the sails, and suspended to the mainmast till the moment of departure, for it was necessary to conceal this precious booty from those who might come to clear the vessel in the roads. At last the Venetians quitted the shore full of joy. They were hardly in the open sea when a great storm arose. We are assured that S. Mark then appeared to the captain and warned him to strike all his sails immediately, lest the ship, driven before the wind, should be wrecked upon hidden rocks. They owned their safety to this miracle. After crossing the Mediterranean and cruising up the Adriatic, the graverobbers reached Venice and handed their cargo over to the Doge. The local religious and civic authorities quickly elected St. Mark as Venice's patron saint, and the apostle's traditional symbol - a winged lion became the logo of the Venetian Republic. The overall design and craftsmanship stands out so as making this pair of cufflinks a true rival of similar jewels produced by the famous European jewelry firms of that time like Cartier, Faberge, etc. 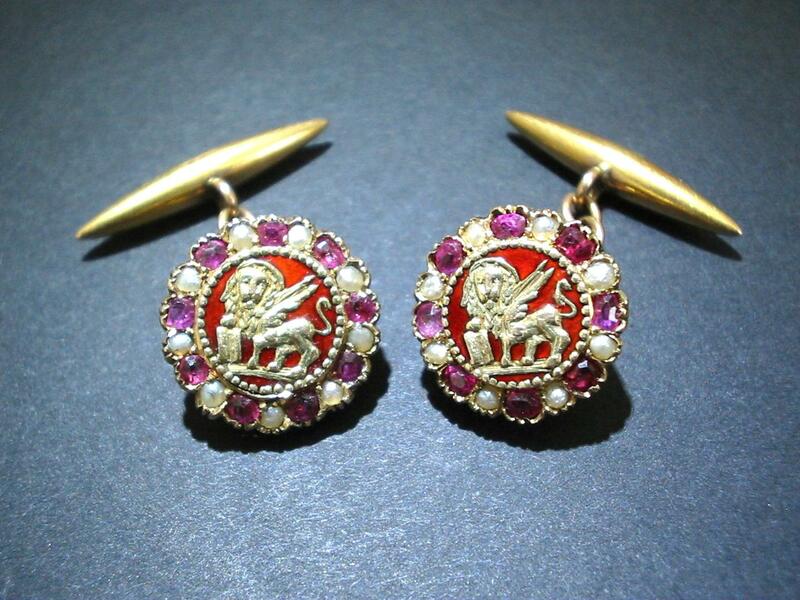 Absolutely scarce and one of a kind antique jewelry / jewellery collector man’s / gents accessories vintage set and one of the rare Venetian Winged Lion of St. Mark enamel, gold and rubies cufflinks and jewels.